As the originator of the American Equality Bill (AEB) Project, it’s been quite a personal journey toward acceptance of the fast by Alan Bounville and Iana Di Bona, called the Civil Rights Fast, now in its 12 day. It’s 12th Day! Before the fast began on November 2nd, the AEB Project was fully invested in stirring the election cycle with the QueerSOS, an action designed to push the issue of our civil rights in the NY Senatorial race. The QueerSOS was intended to ideally secure the filing of the AEB, but also to demonstrate the importance of an active movement pushing an LGBT agenda during election cycles. This idea counters converntional wisdom. For decades, the LGBT movement has embraced an election strategy of “electing friends” and “supporting supporters” which is effectively a DNC electoral mindset that has coopted our ethical allegence, preempting a singularity of loyalty to our issues and cause. Serving two masters is a recipe for conflicts of interest, and indisputably, at election time, the DNC’s mandate prevails, while pushing democratic candidates to bigger goals – or holding them accountable for failing to deliver – is not only disfavored, but actively and agressively discouraged on the ground. As a result of this mentality, the QueerSOS came under tremendous assault from NY activists, spearheaded by The Power On Line which has its own lingering civil-rights back-room strategy, and individual activists from Nevada to D.C. to Seattle. 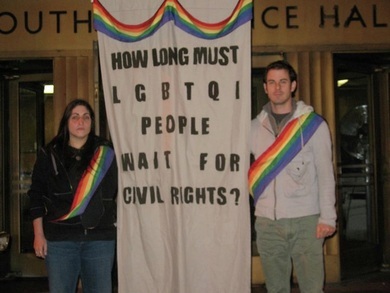 Whether standing down or agressively undermining AEB activists, this opposition kept bodies from the QueerSOS which held a daily vigil outside of Senator Gillibrand’s campaign office from September 27 to November 2, the longest-running vigil for LGBT equality in history. The major LGBT media, bloggers, newspapers and magazines seemed equally intent on hushing any challenge from the new movement to Senator Gillibrand on our future interests. Her strong support for the singularity of DADT repeal was enough, despite its pending passage and the length of a senate-term. Enough for most, but not all. As a strategist, in light of this aggressive internal opposition, my inclination was to recalculate any plans for a fast, which Alan has been determined to do since a personal revelation months ago. During the QueerSOS, Iana DiBona felt drawn to fast herself. Her personal charm to my mind made her the perfect poster child for the fast, someone who might offer the mother-madonna visual, someone loved by all the disparate voices that had assailed the QueerSOS and personally attacked me and Alan for it, but Alan was decided and could not be deterred. Like so many who disagree with strategy, I distanced myself from Alan and even the QueerSOS that I had spent months laying the ground work for. His steamrolling attitude and indifferent ego was alienating. He lacked any respect for collaboration, and expected everyone to just follow in his wake. It was unbearable. But here we are on Day 12 of his fast, and his determination has melted my heart. For I share his desperation, but not his reckless determination. I shared his goal, but not his leadership. Ultimately, although I dreamed of the AEB filing in November, I wasn’t willing to sacrifice my logic for our purpose. I was wrong.